The long awaited PUBLICS Library will be launched on May 30th. 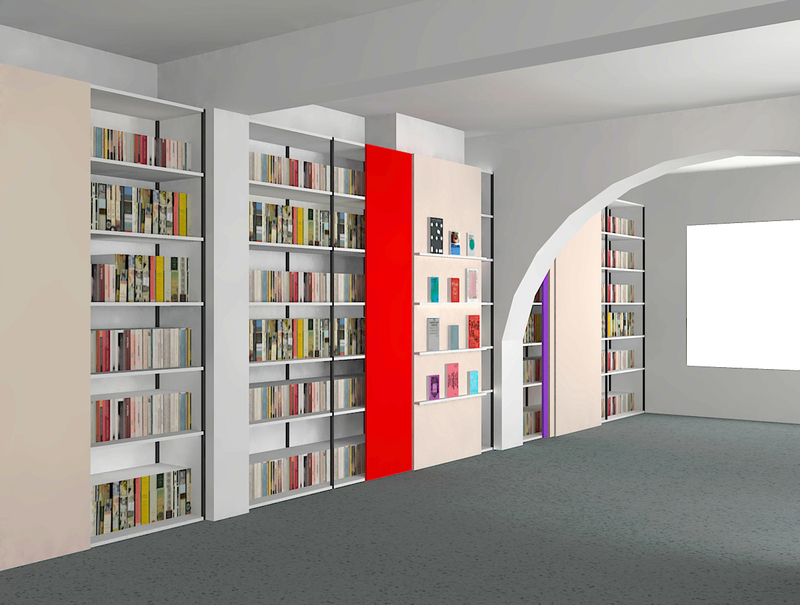 The library has been designed by internationally renowned collective design studio Julia, who are also responsible for PUBLICS’ new web-site, which is now live. The opening of PUBLICS Library will coincide with the unveiling of Eat the Rich (2018), a new outdoor sign specifically produced and donated to PUBLICS by the artist Liam Gillick. Additionally, artist Kathrin Böhm has initiated Thinking Things in the Making (2018),an on-going series of commentary posters based on her selection of titles from the PUBLICS library. This series will expand and grow with PUBLICS Library as an ongoing interpretation of the glue between discourse and action. PUBLICS Library is developed and programmed – along with PUBLICS Talks, Events and Performances – in parallel with longer-term curatorial programmes in the form of PUBLICS Public Art Commissions. PUBLICS Library is a public research space dedicated to critical social thinking, learning and education – a place for coming together, discussing, reading and thinking about contemporary art and its many publics. The library is dedicated to representing and challenging the many concepts, theories and practices of curating contemporary art and publicness. It will be open to the public every Tuesday and by appointment. Books are available to read, to study and to browse on site. The Library’s bibliography will continue to be catalogued, indexed and made available on-line for reference. PUBLICS Library is one of the most comprehensive, focused and detailed art organization libraries in the world dedicated to themes of publicness; public art and activism; socially-engaged practices; radical education; critical curatorial practices; and their exhibition histories and theories since the 1960s onwards. The library contains an enormous volume of texts, publications, catalogues, editions, rare books and audio-visual recordings exploring art’s relationship with society, politics, curatorial practice and its many publics. For the launch, PUBLICS has also invited Rab-Rab: Journal for Political and Formal Inquiries in Art to produce the first of many interventions into the content, form and structure of the library. The ensuing series of curatorial, artistic, and editorial interventions will be among many regular activities carried out in the PUBLICS Library space, along with readings, seminars, and workshops with local and international cultural thinkers and practitioners. The evening will begin with a PUBLICS Talk by Gediminas Urbonas entitled The Pro-test Lab Case: Organizational Aesthetics and Emotional Infrastructure. Gediminas will introduce the project, The Pro-test Lab, which he began with his partner Nomeda in 2005. The Pro-test Lab is a call to reclaim public space in the city of Vilnius, Lithuania – in particular, to keep the city’s largest cinema, Lietuva, from being demolished. This project addresses memory, trauma and emotions attached to public space, while combining public discussions, exhibitions, a media channel, performances, an educational program, a series of petitions, and even legal actions. The Pro-test Lab calls into question national development policies and territorial planning, and acts to initiate debate around the notions of privatization and publicness, art and ethics, activism and production. Available exclusively at PUBLICS on the night will be Public Space? Lost and Found (SA+P Press; MIT Press, 2017) – edited by Gediminas together with Ann Lui and Lucas Freeman – which brings together artists, planners, theorists and art historians in an examination of the complex interrelations between the creation and uses of public space and the roles that public art plays therein. PUBLICS Library will be open to its publics on Tuesdays 10am-5pm and by appointment.